1. 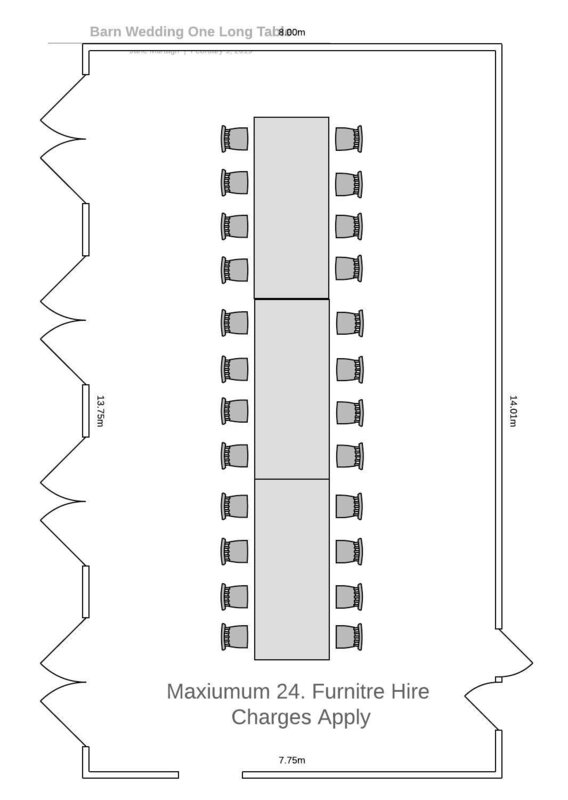 Choose your top table shape, and how many people will be on it. 2. Decide where you'd like it to go. 3. 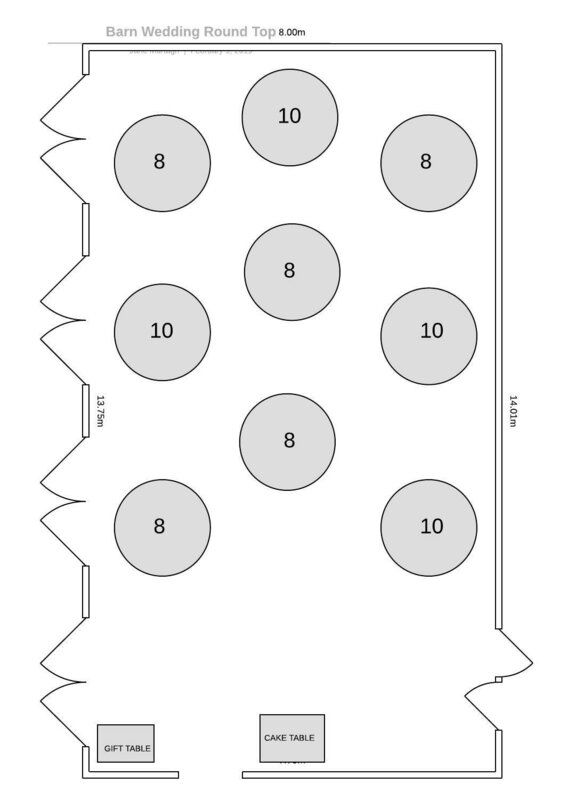 Split your guests between tables of 10 as much as possible. Don't forget, children including highchairs count as a 'seat' at the table. Sometimes 11's are possible, if you have hired in chairs not our standard Oak chairs, as these are too wide to seat an 11th guest. If you'd like your top table central, under a hoop or hanging decoration, we will offset your tables slightly to ensure you are under the hanging decor. 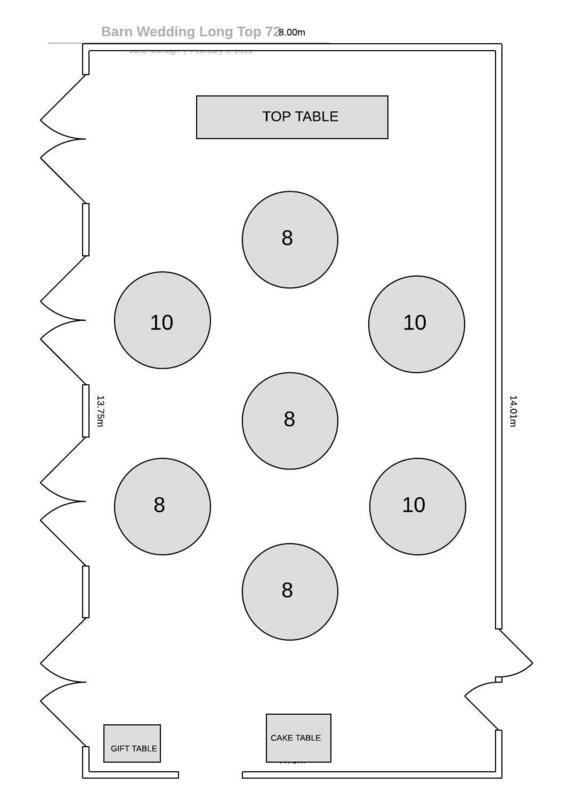 The maximum capacity with the dance floor screen up is 14 round tables, or 13 rounds plus a sweetheart top table. If you'd like a long top table you can have 12 round tables maximum. The Sweetheart table can locate anywhere in the room, in place of 1 round table. You can have your round top table any where in the room. A speciality of our in house Stylist Idyllic Days, this table can seat as shown or less. Both layouts below position the feature table in the ideal place to have a hanging decoration above it. Whilst you can have your top table along the 'window end' of the Event Suite, we do not advise this for summer weddings, as you may end up rather hot with your back to the sun. 3. Split your guests between tables of 8 as much as possible, with up to 2 tables of 9-10 guests, if necessary. Larger tables must be positioned at the sides of the room. Your finalised plan should have no more than 8 tables total. Don't forget, children including highchairs count as a 'seat' at the table. ​If you have more than 74 guests, your tables will need to all be round, including your top table, and you will need to fill 5 tables of 8, and 5 of 10. ​If you have a church wedding, and therefore we are not doing a room change in between ceremony and wedding breakfast, you may be permitted to have more 10's if you need them - please speak to our event team for guidance. You can replace any of the round tables with a sweetheart top if you prefer. Your 'top' table can be any you'd like but remembering no 10's in the centre if preferable. Your long top will need to be at the 'top' of the room, and can seat maximum 12. Bespoke table arrangements depend on your guest numbers, please contact us with your requirements and we will advise suitability and costs. We recommend www.hitched.co.uk for managing your guest list, and completing your table plan. Both these sites are tried, tested and voted reliable by our previous couples! submitting your guests food choices. Please download the below spreadsheet to submit your guests menu choices. Below is also a video which I hope helps you complete the spreadsheet quickly & easily.